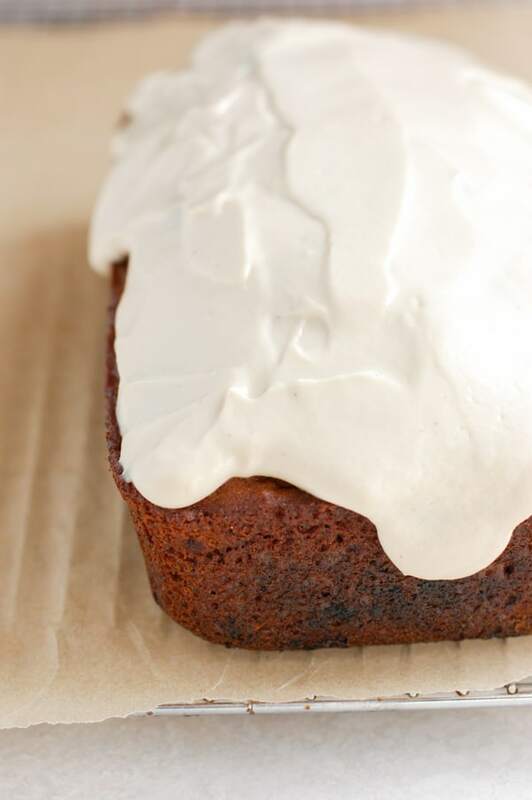 A delicious healthy recipe for carrot cake banana bread made with no refined sugar, plump raisins, and an easy and delish vegan cashew cream cheese frosting! Enjoy for breakfast or to bring to a holiday brunch! 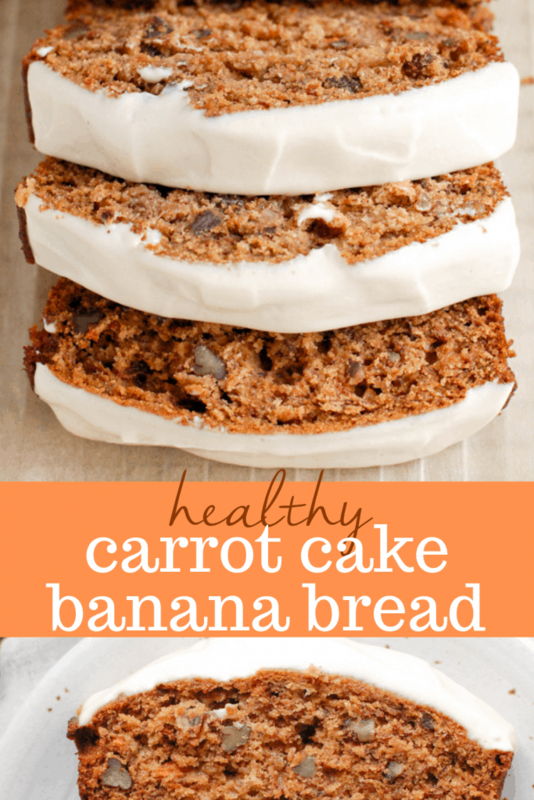 If you love carrot cake or banana bread, well I’ve got the perfect match for you. Bet you didn’t ever really think to combine two of life’s greatest desserts into one? Well, I did. 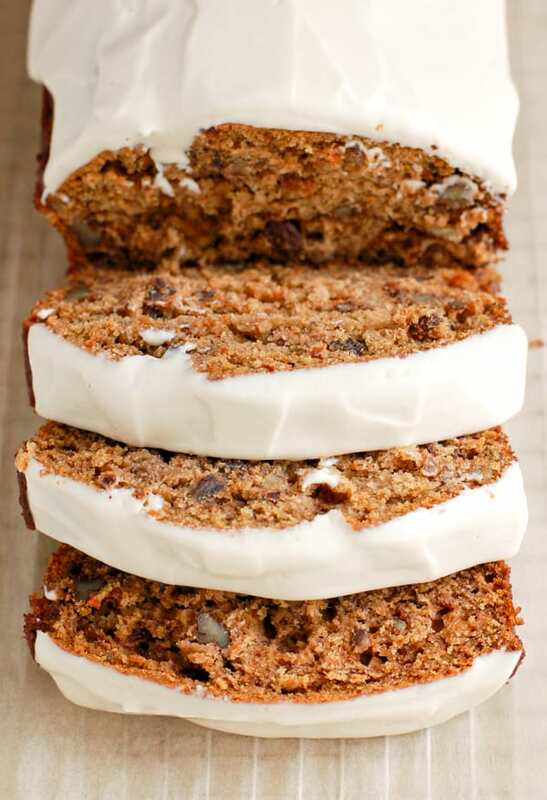 Anytime I can get away with eating carrot cake for breakfast is a perfect day to me. Something about the two of these combined just tastes like my childhood in a loaf. 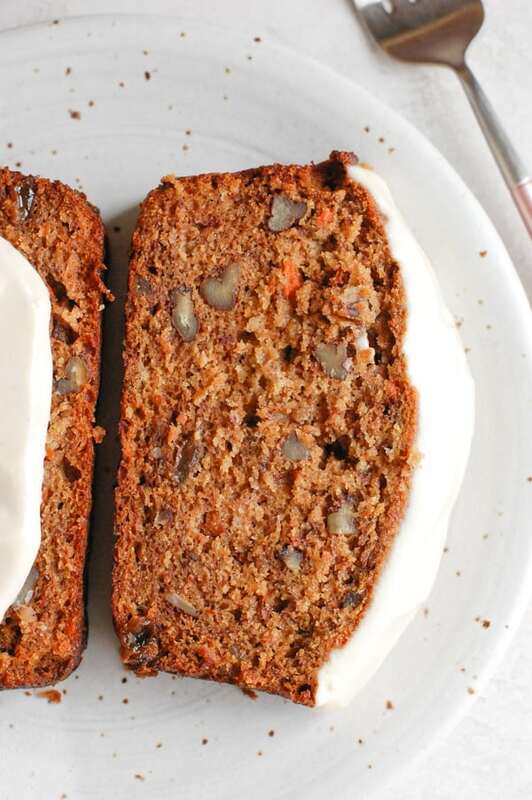 It’s almost like sweet, healthy banana bread made with ripe bananas and fresh carrot cake filled with plump raisins and walnuts just had a baby. 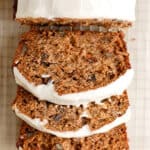 This recipe is a healthier twist on the traditional banana bread recipe and the traditional carrot cake recipe. Yep! 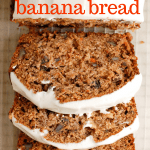 I said it, you can easily turn this carrot cake banana bread into muffins if you want! All you need to do is line a muffin tin with liners or spray it real good with nonstick spray, then pour batter into each cup until it’s 2/3 full. You’ll want to bake for 17-20 minutes or until toothpick inserted in the middle comes out nice and clean. Bananas and grated carrots, of course! 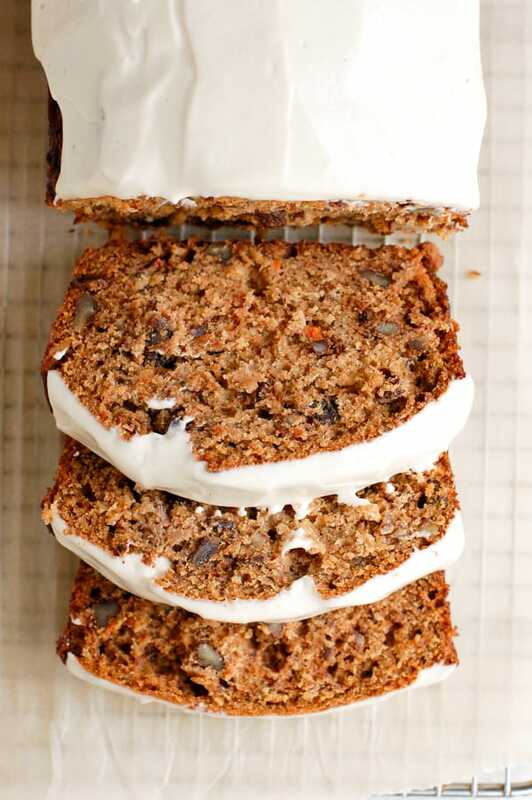 Super ripe bananas and fresh grated carrots work best in this recipe. White whole wheat flour – you can swap this with all purpose, regular whole wheat flour, or gluten-free 1:1 flour but I prefer the fluffy texture of white whole wheat best. 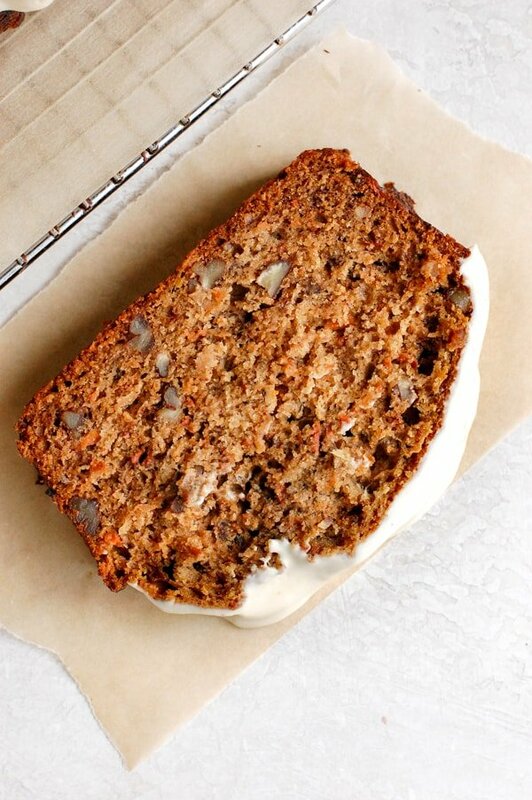 Honey – one of my favorite ways to sweeten a banana bread is with natural sugar. Bananas already have some sugar in them so you don’t need much! If you haven’t realized by now, baking with coconut oil is my absolute favorite way to make anything sweet. It’s the only oil I use when baking, actually, because it can be fragrant and subtly sweet for baking. But it can also be completely flavorless! Since most coconut oil solidifies at room temperature, you’ll want to measure it once it has been completely melted. I sometimes even buy liquid coconut oil so that it always stays liquid at room temperature and is easier to measure. My biggest tip for working with coconut oil that isn’t always room temperature: bring all of your other ingredients to room temp. If you try to whisk eggs straight from the fridge with your coconut oil, it will solidify and clump up. I bring my eggs to room temp placing them in the oven for about 5 minutes while it starts to heat up. This same thing is to be said with any other ingredient that you’re using straight from the fridge! Unrefined coconut oil undergoes minimal processing, which causes there to still be a little bit of coconut flavor in the oil, whereas refined coconut oil does not have any flavor whatsoever because it has been high-heat processed, and ‘refined’ a little bit more. Preheat oven to 350F and prepare bread pan with nonstick spray or parchment paper. In a large bowl, whisk together mashed bananas and eggs. Add in oil, honey, and vanilla. Stir till combined. In a medium bowl, stir together flour, baking soda, salt, cinnamon, nutmeg. Add dry ingredients into wet ingredients and stir until fully combined. Add in grated carrots, nuts, and raisins. Stir in any desired mix-ins. Pour into prepared bread pan and bake in oven for 45-55 minutes or until toothpick inserted comes out clean. While baking, combine frosting ingredients (cashews, filtered water, maple syrup, vanilla, salt) in a high powered blender, like a Vitamix. Blend until completely smooth, scraping along the sides as needed. This could take a couple minutes. Place in refrigerator to thicken. When loaf is COMPLETELY cooled, ice the top of the bread. Looks amazing! What kind of GF flour can I use instead of whole wheat if I’m gluten intolerant? Any 1:1 gluten free flour replacement should work just fine! YOU ARE AMAZING!! I need to try it with almond flour and coconut flour – you obviously know what youre doing in the kitchen because that is the perfect gluten-free blend! 🙂 Thanks for sharing! !